Delaney Chicken was my second restaurant concept. 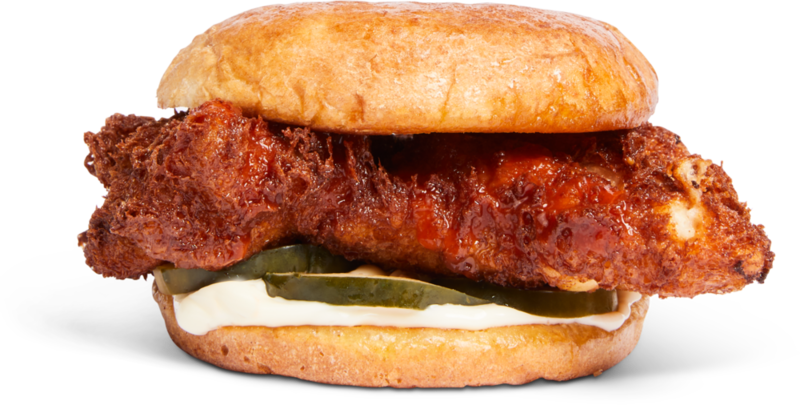 With it, I departed from the full-service model, and instead developed a quick service concept focused on fried chicken sandwiches. The small menu consisted of four sandwich options, each made with a boneless, skinless chicken thigh that got brined overnight, and fried with a special battering process. This resulted in a hybrid texture that combined the flavors of spicy southern fried chicken, with the lightness of tempura. The restaurant also served French fries, a creamy coleslaw, and homemade drinks. The logo for Delaney Chicken, designed by Drew Heffron, and was informed by the Delaney Barbecue logo, a cow with dotted butchery lines. We borrowed the same dotted line convention, this time applying it to a chicken. Ultimately, something was missing. A bow tie. I art directed the design of Delaney Chicken, and drew my inspiration from the pre-fabricated interior paneling of butcher shops and diners of the 1950’s. These elements came through in black varnished headboard wasincoting, powder coated metal panels made to look like antique porcelain steel, and period specific lighting. Our team also wore all white uniforms with black bowties, which underscored the theme. This is an architectural rendering of a larger Delaney Chicken we considered opening at a North Jersey shopping mall. Delaney Chicken team members wore all white uniforms with black bowties, echoing the 1930’s diners.